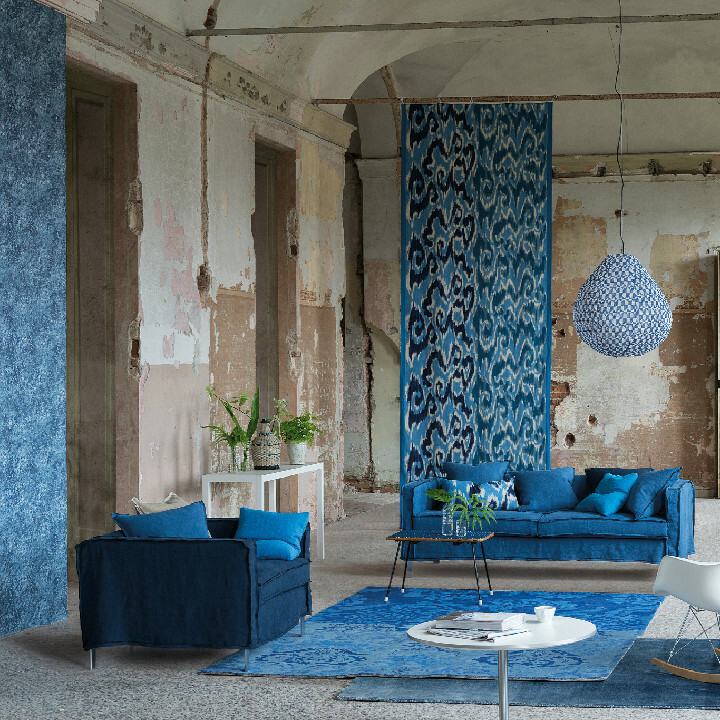 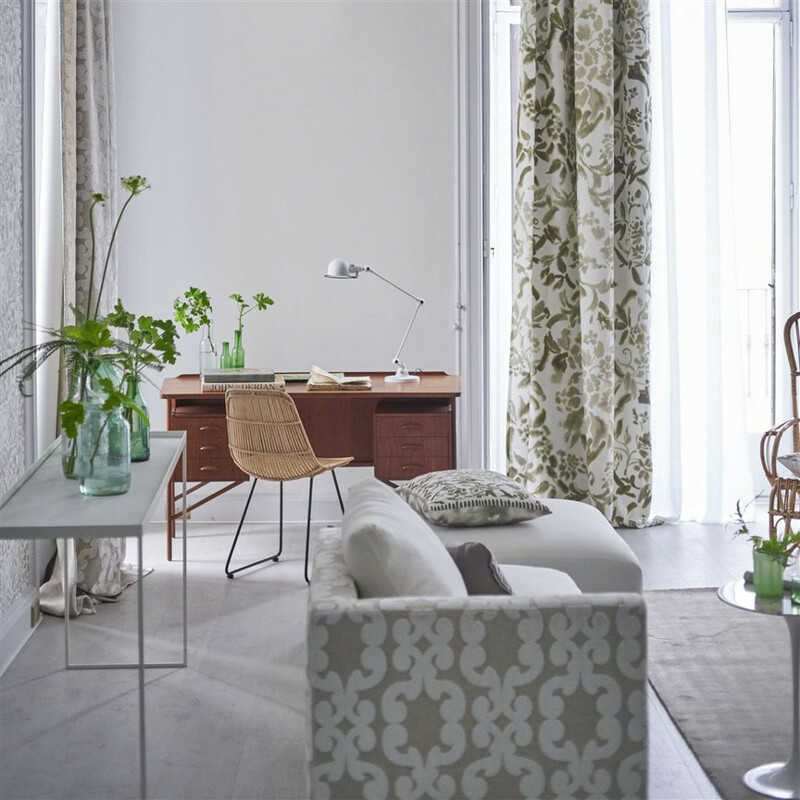 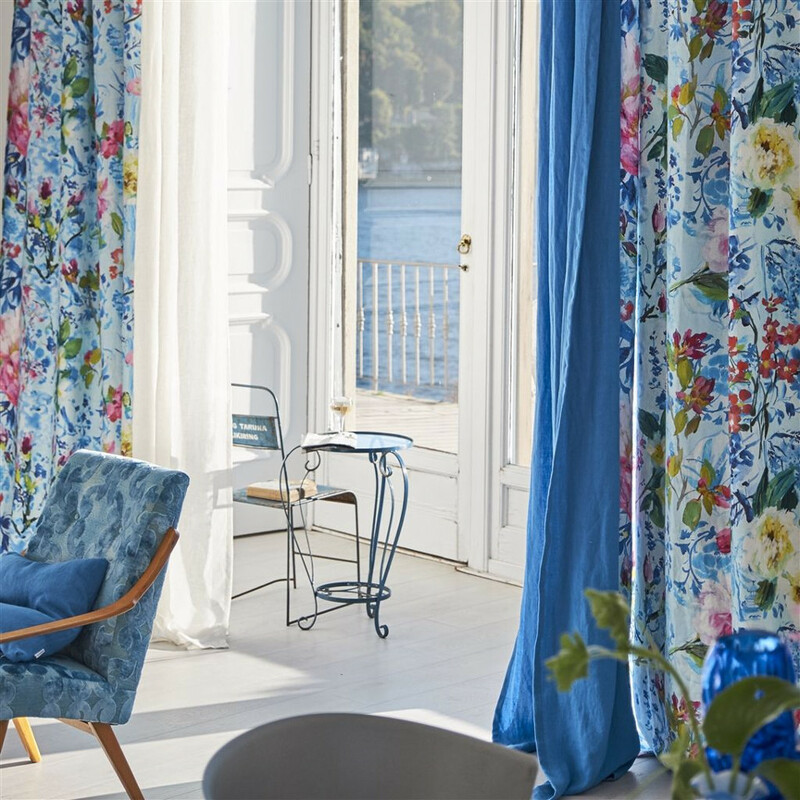 Influenced by a diverse range of inspirations, including eastern decorative and classical documents, Designers Guild has one of the largest ranges of fabrics available across the globe. 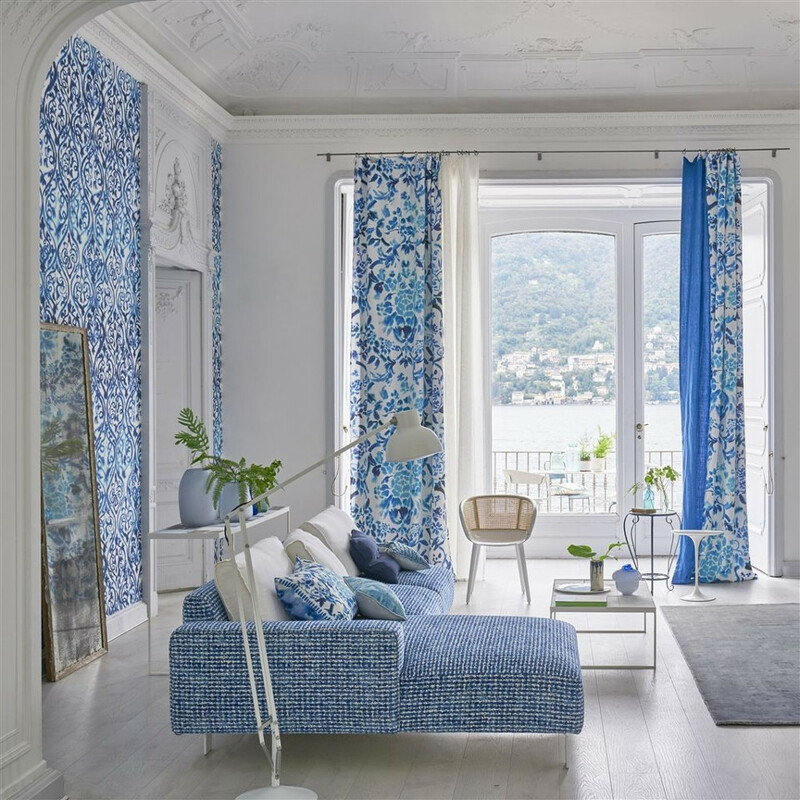 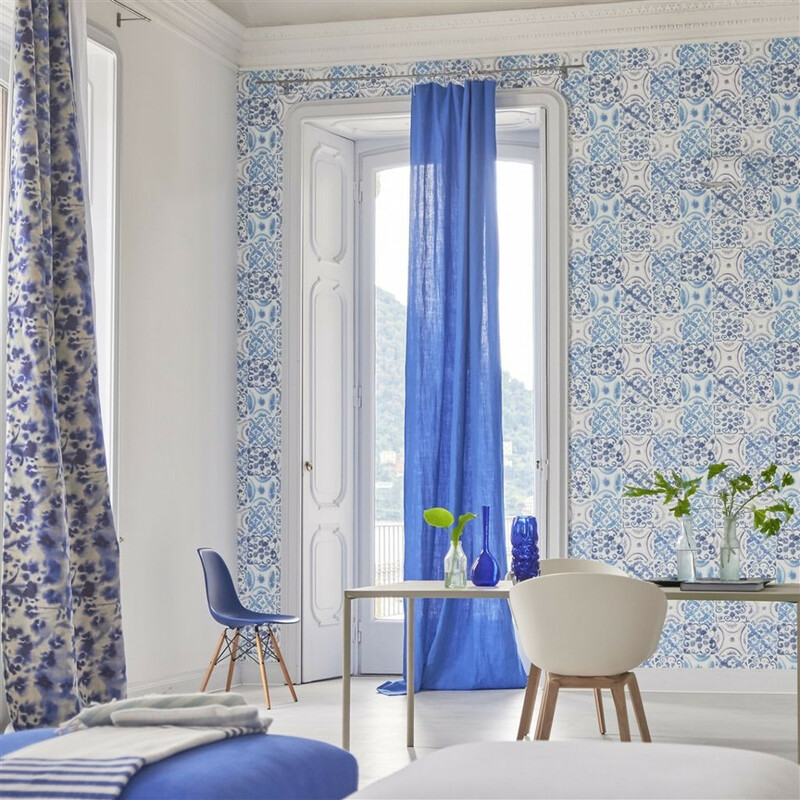 Established by Tricia Guild in 1970, Designers Guild produce a wide range of fabrics, wallpapers, upholstery, and bath and bedroom collections. 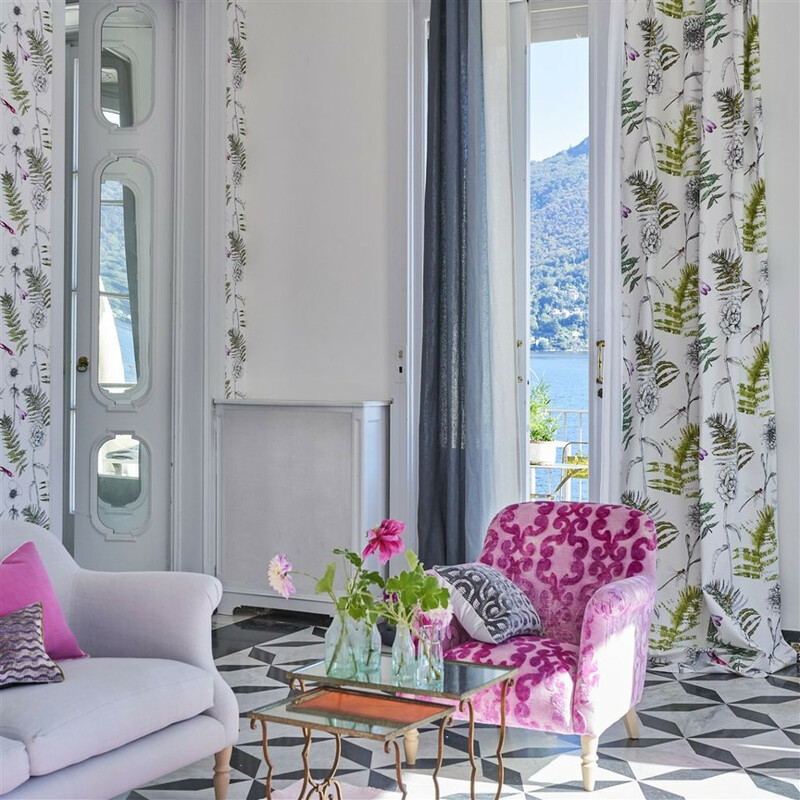 After more than 40 years in the business they still look to inspire and innovate at the highest level with their designs, products and services. 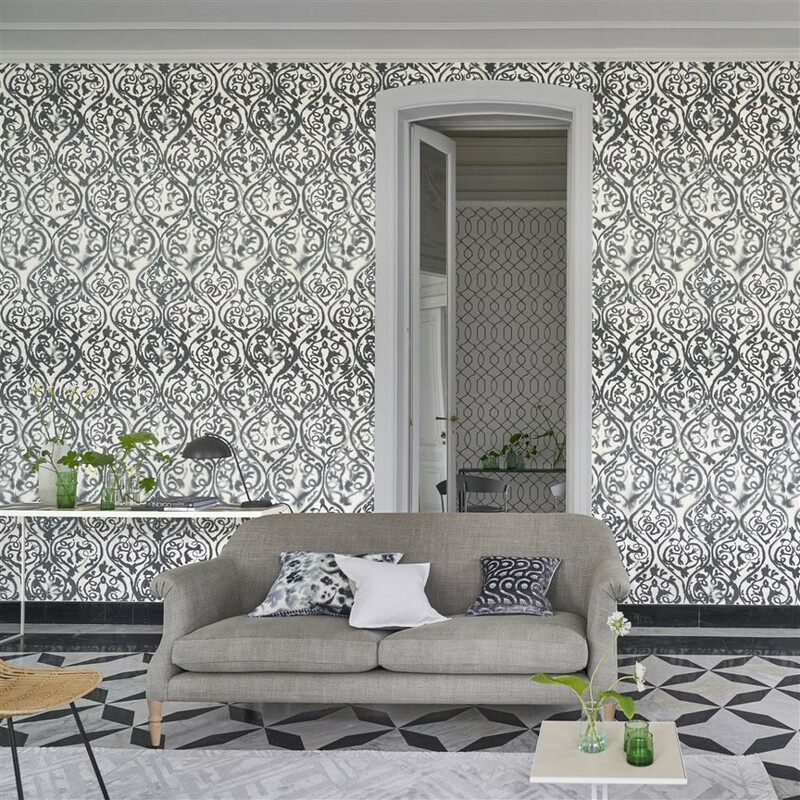 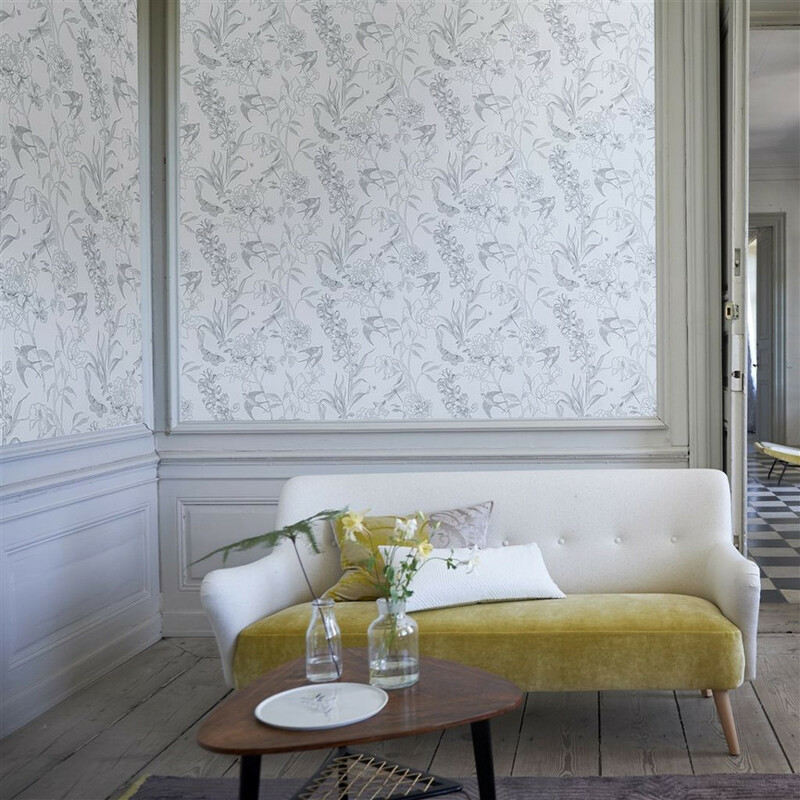 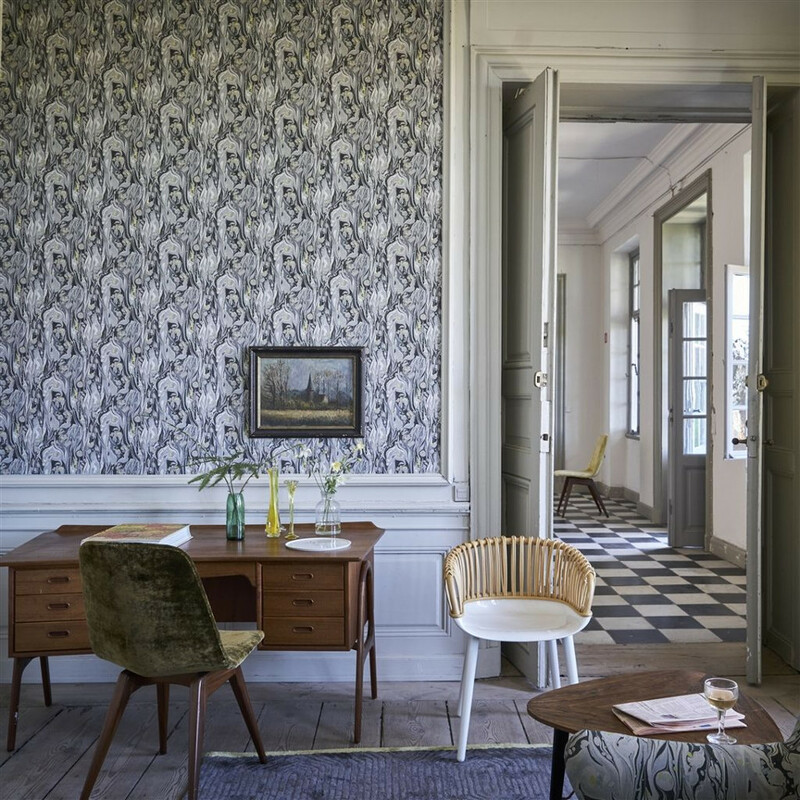 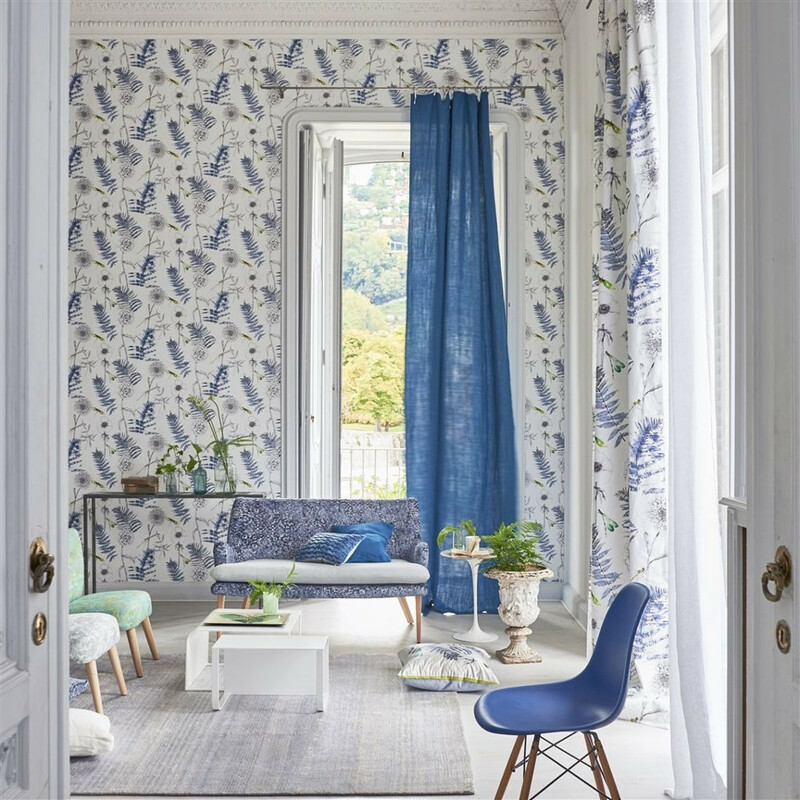 “We believe in quality of design, product and service combined with a committed and motivated team.” Designers Guild have over 9,000 fabrics and 2,000 wallpapers ranging from some great geometrics to flocks, damasks, florals, textures and plains. 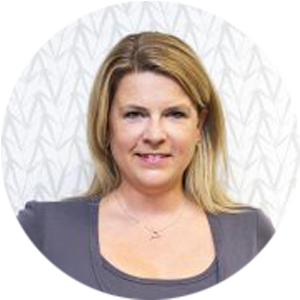 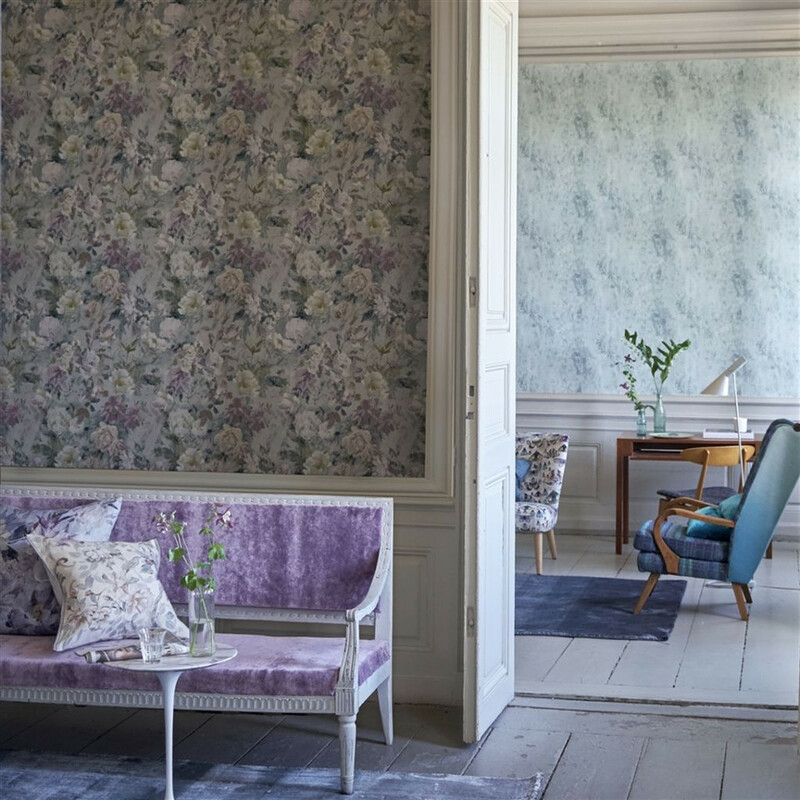 Their high standards mean that the fabric they use are the finest Egyptian cottons, Scottish linens and Swiss woven damasks whilst the wallpapers are printed using state of the art technology. 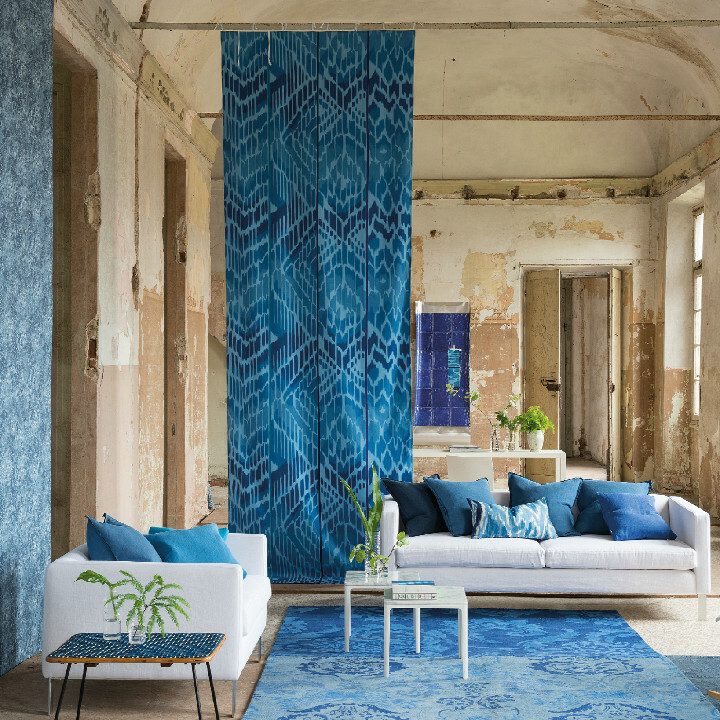 Designers Guild are continually expanding their collections and are constantly introducing new products like rugs, towels and home fragrance. 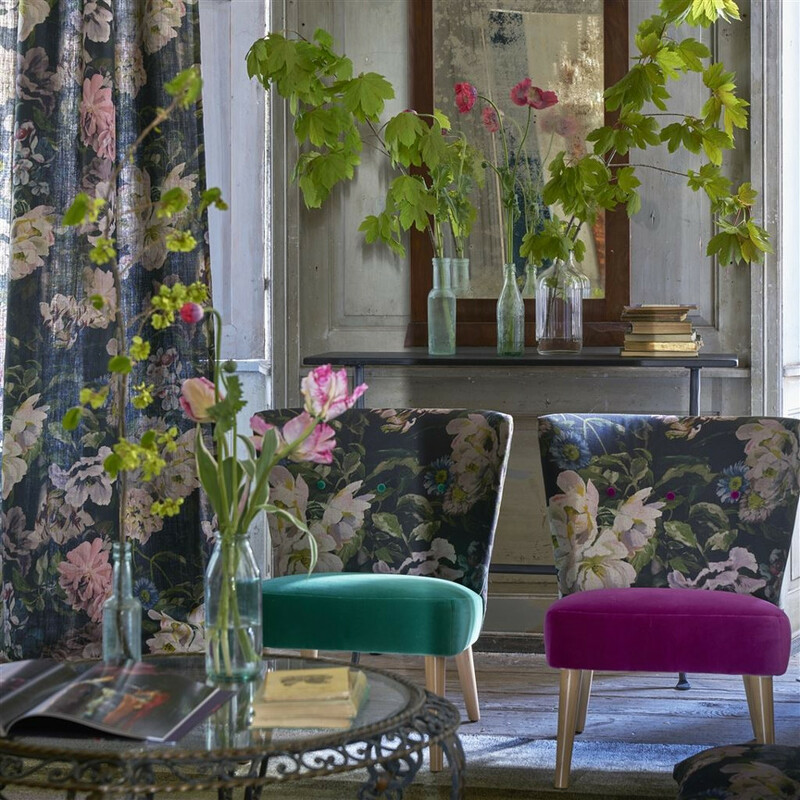 We are able to order not just the collections you see here but any of the fabrics, wallpapers and products that Designers Guild create. 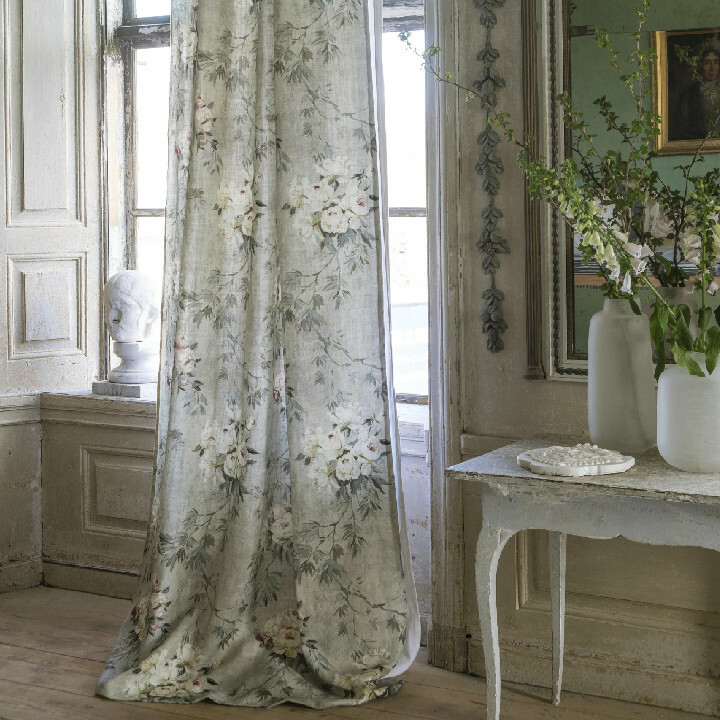 John Derian Company Inc. was established in New York in 1989 and is well known for his innovative and sensitive style. 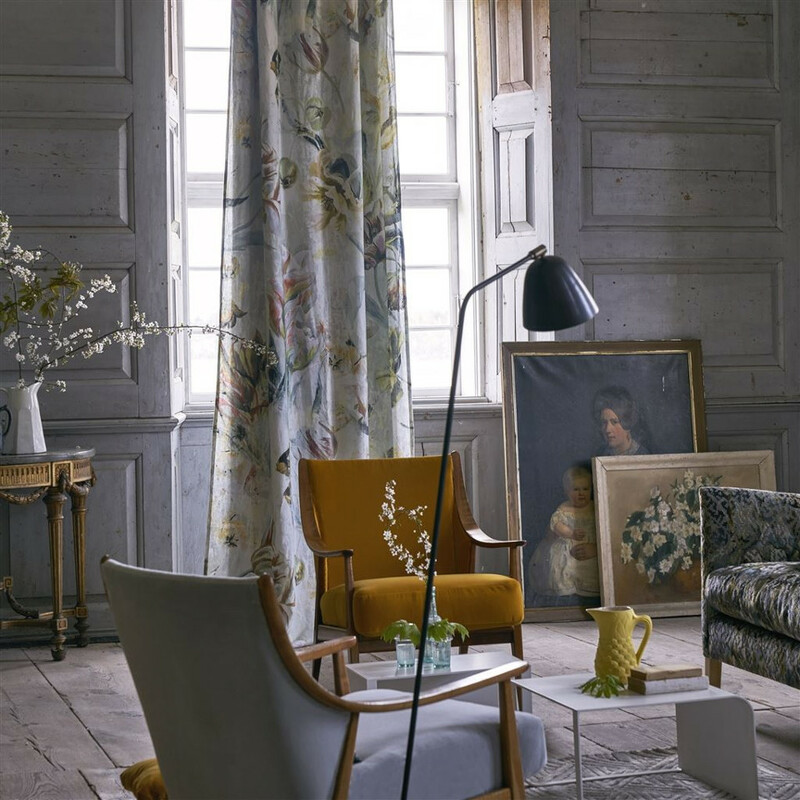 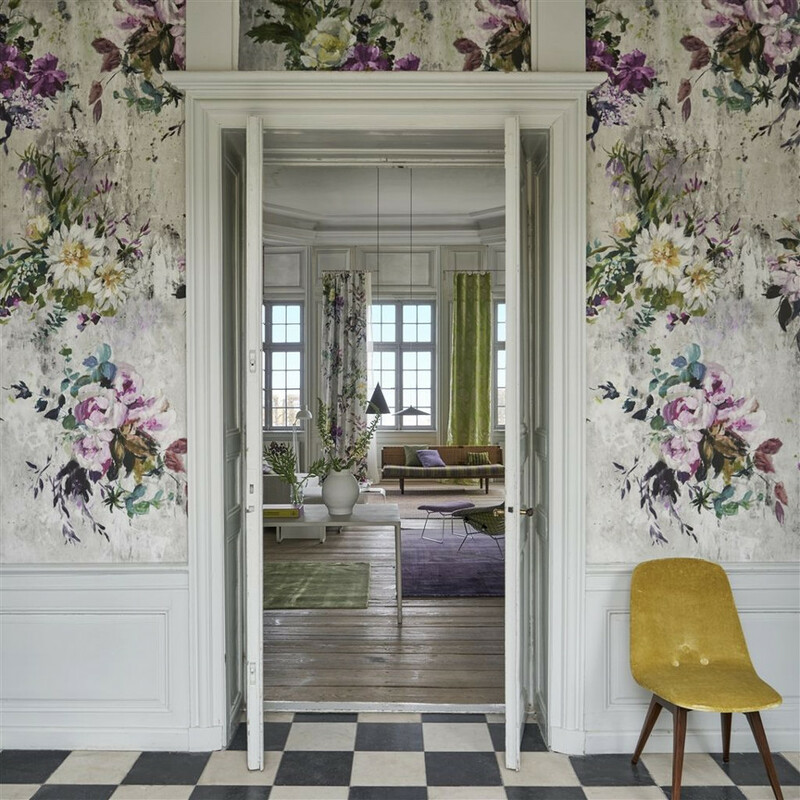 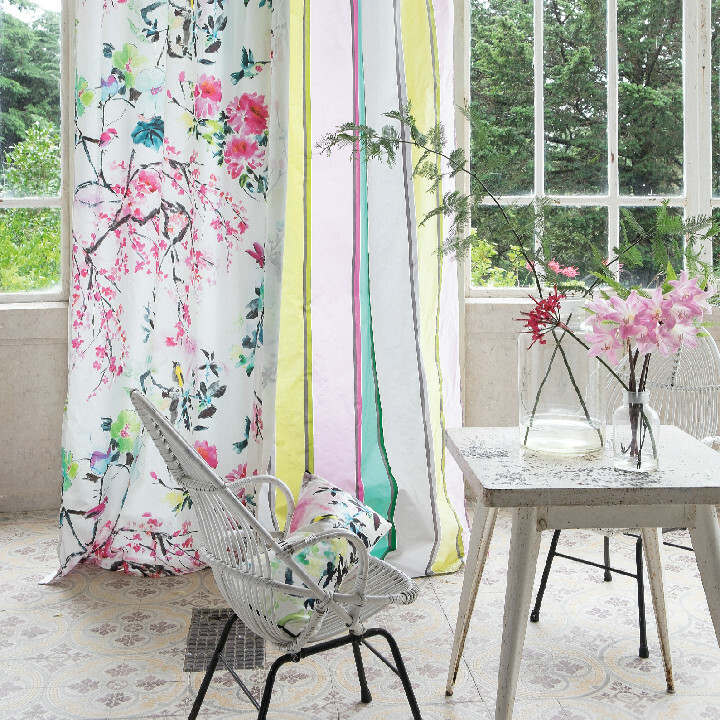 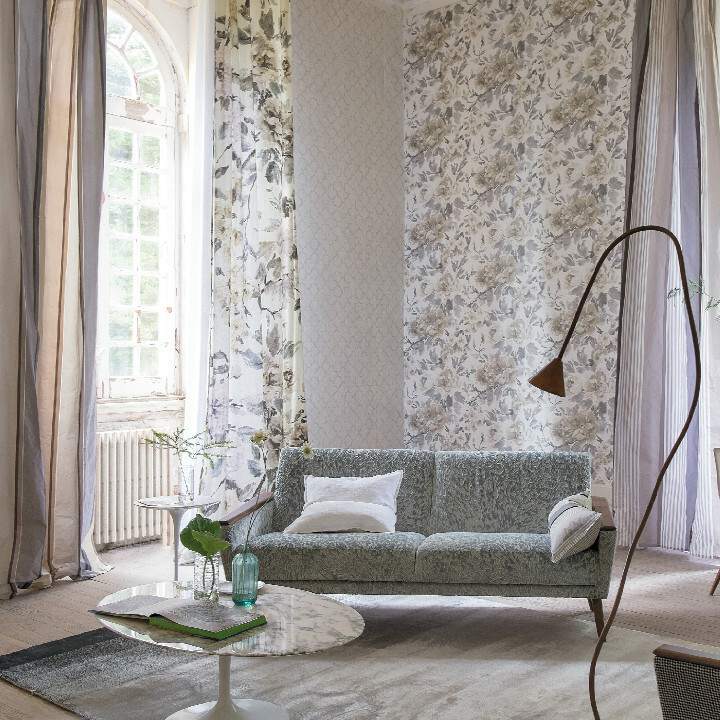 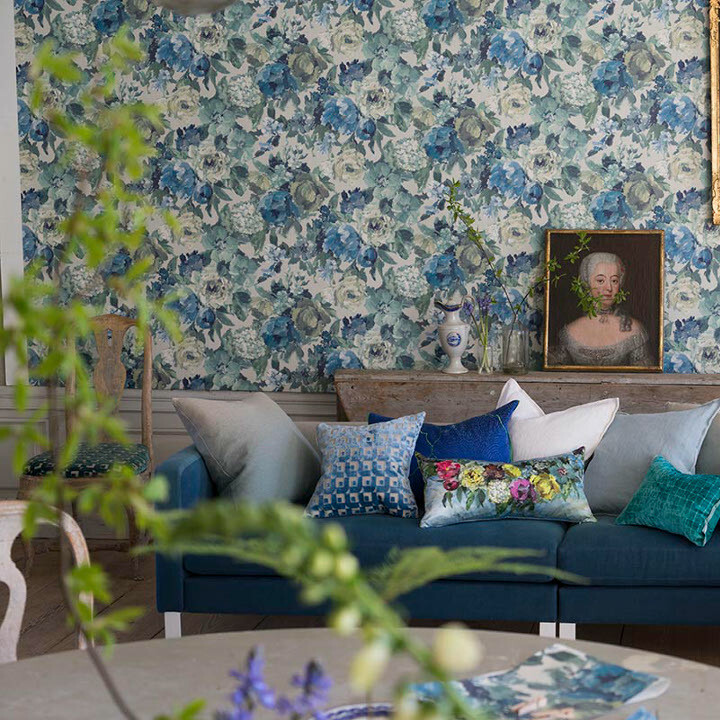 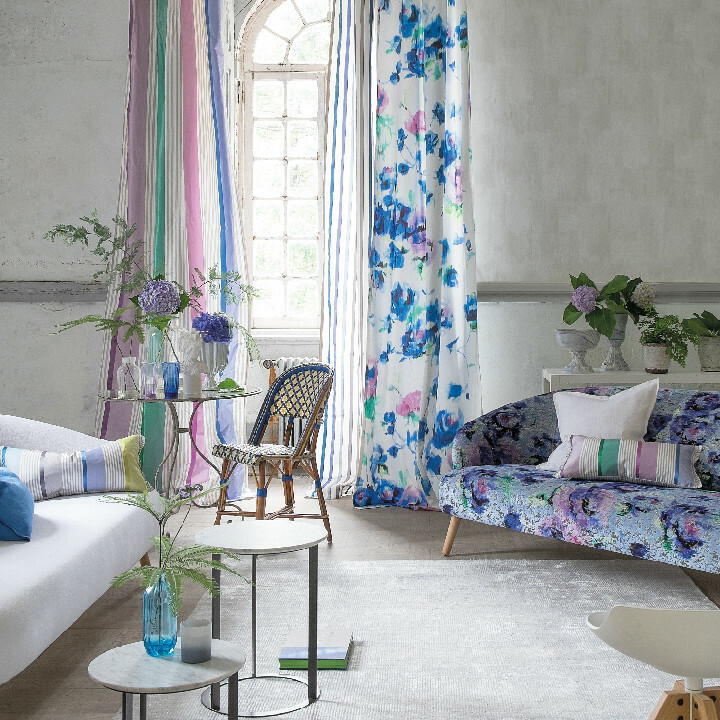 Designers Guild are delighted to launch a range of fabrics and wallpapers that capture his inimitable style with intricate botanical illustrations, romantic florals and vintage prints. 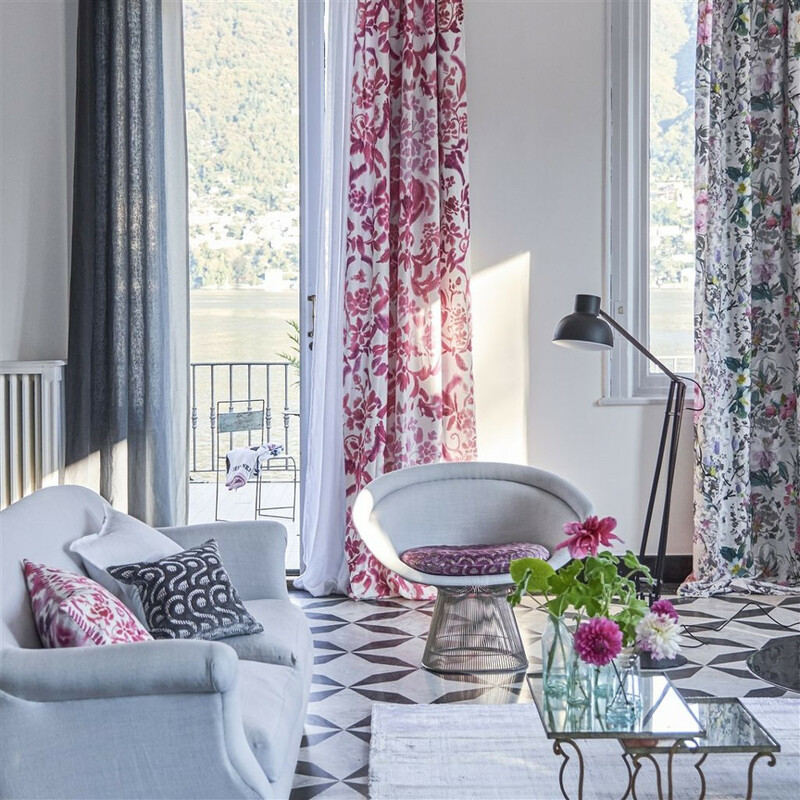 Celebrating the artistry, complexity and extraordinary colours of Murano glassware, this wonderful collection of weaves is both glamorous and eminently useable. 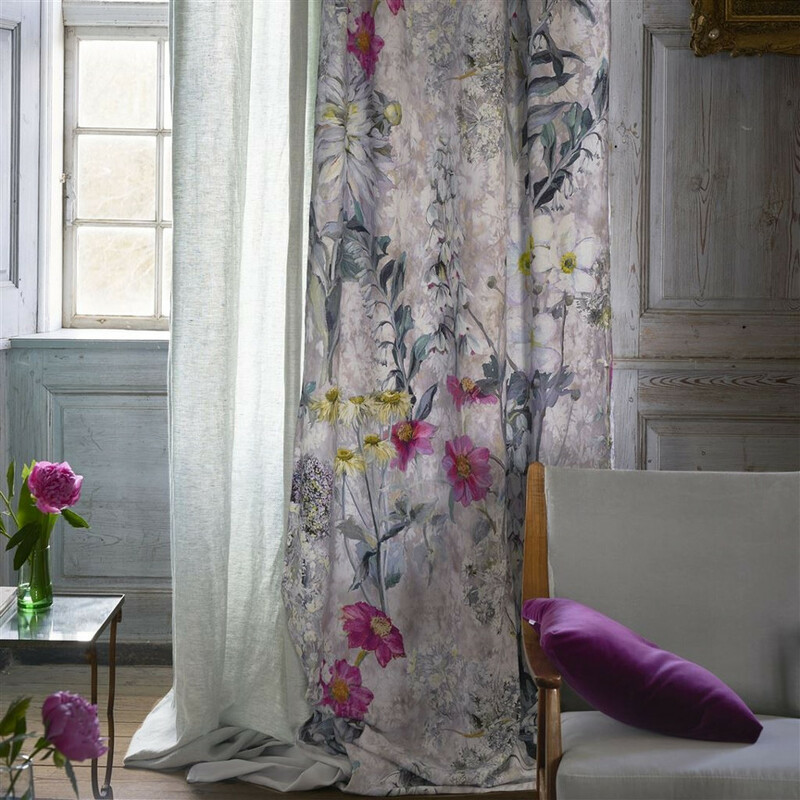 A collection of exquisite floral prints in varying scales, printed on heavyweight non-woven substrates in a palette of ravishing colourways. 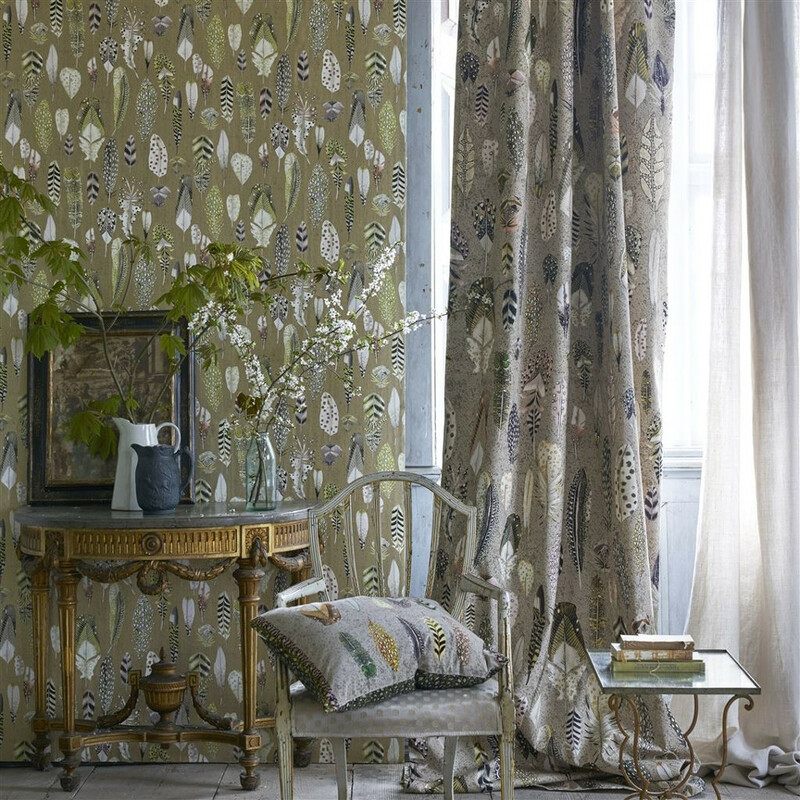 Also included are smart bookcloth marbled prints, fantastic organic natural textures and the most exquisite renderings of exotic butterflies. 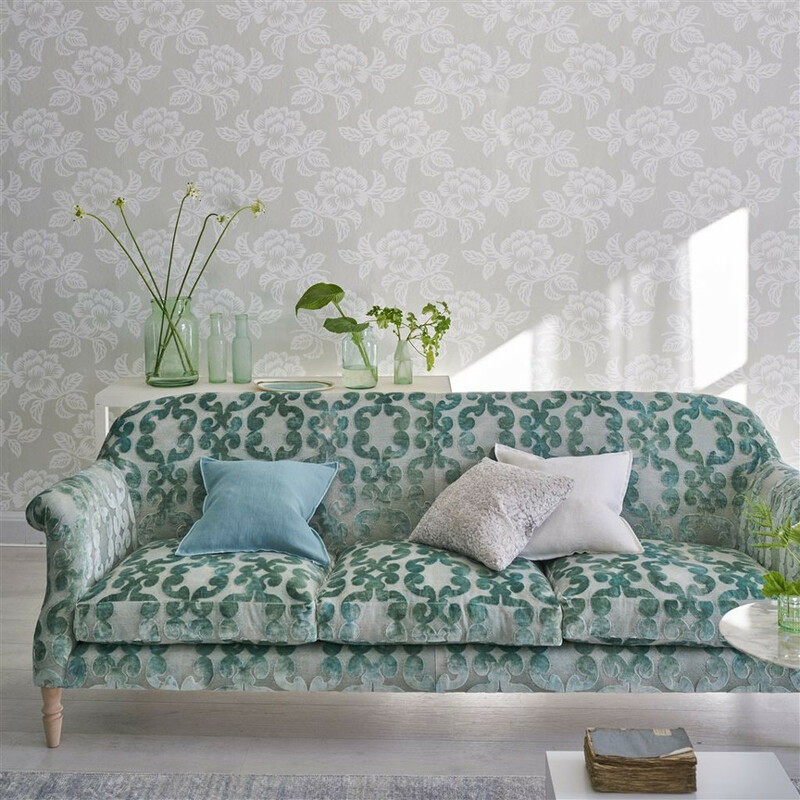 Majolica fabrics are inspired by the intense pigments and shades found in Majolica ware – this collection of digitally printed designs includes extraordinary contemporary florals in varying scales as well as more classical damasks and subtle marbleised textures. 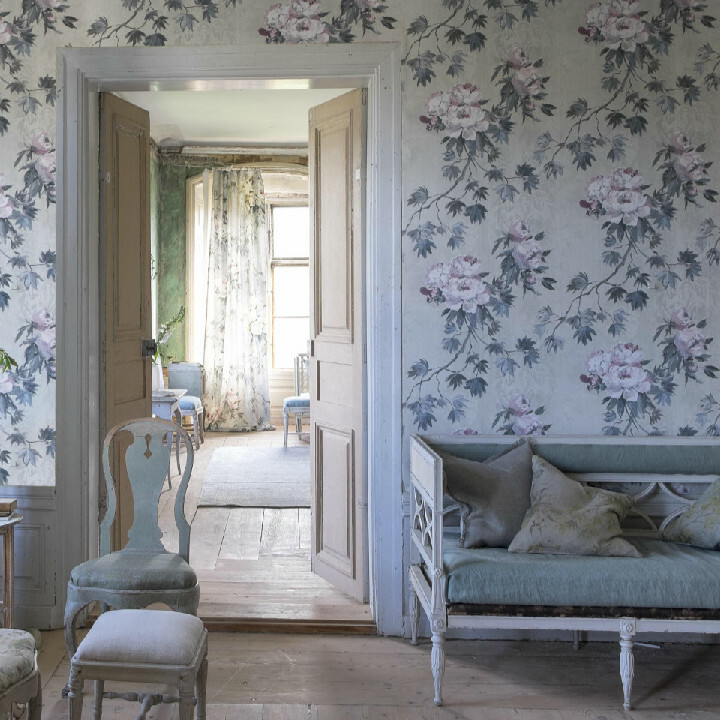 Majolica wallpaper – From timeless damasks and elegant geometric designs to show stopping florals; exquisite botanical studies and truly special textures, Available in a range of beautiful colours from soft plaster and natural shades to more intense tones. 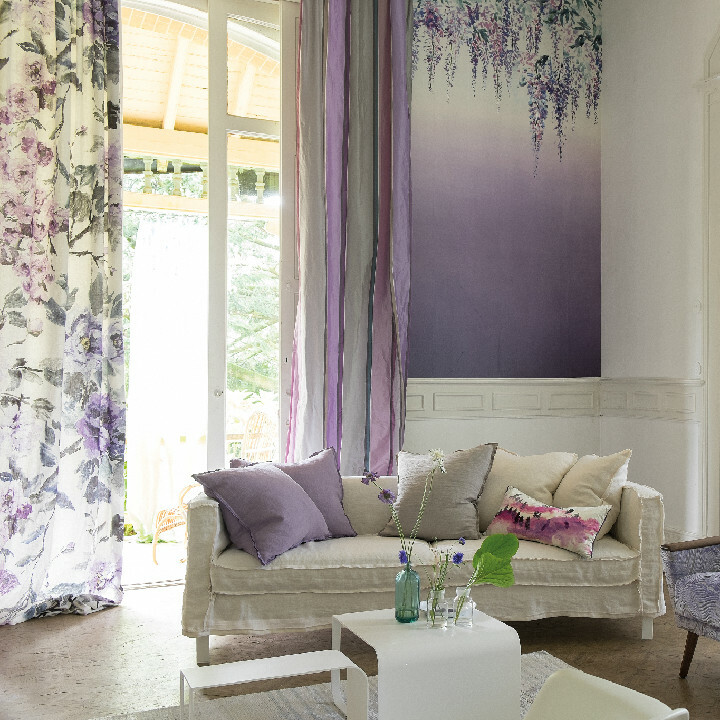 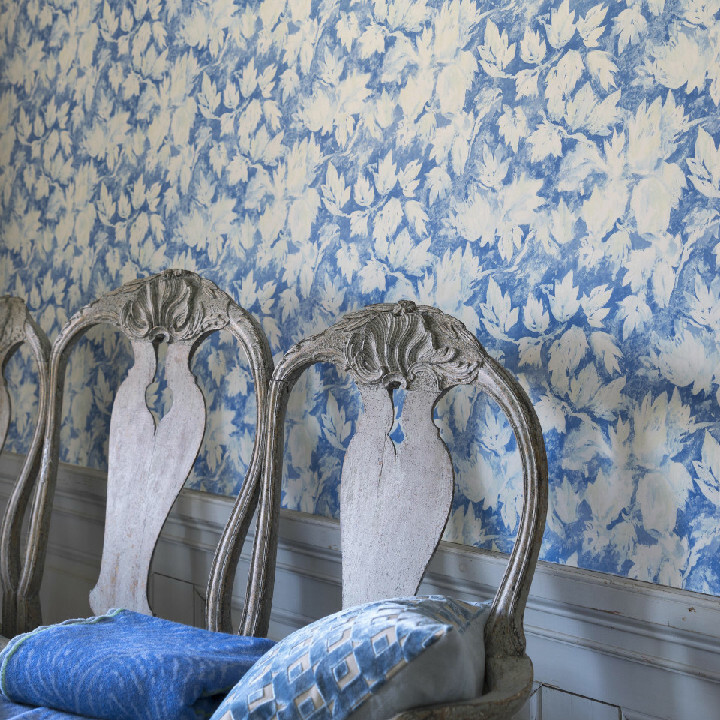 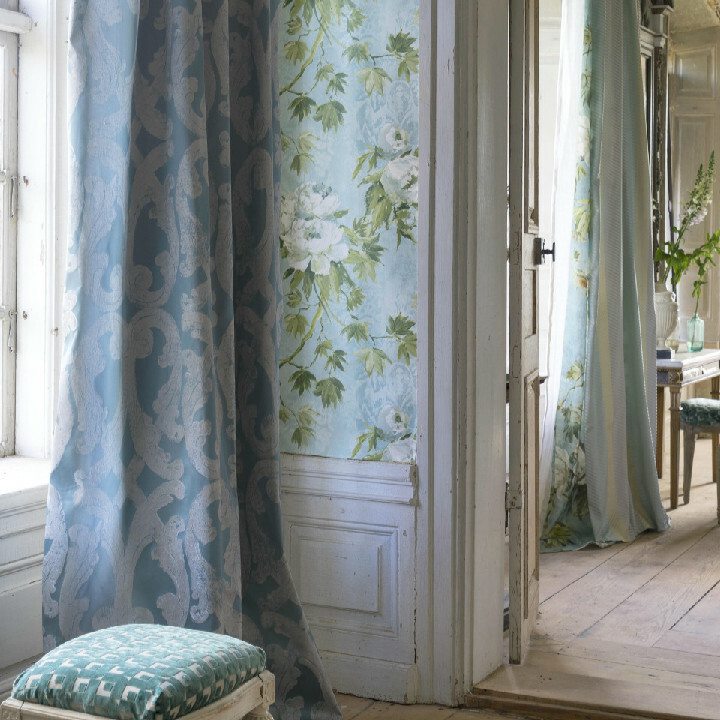 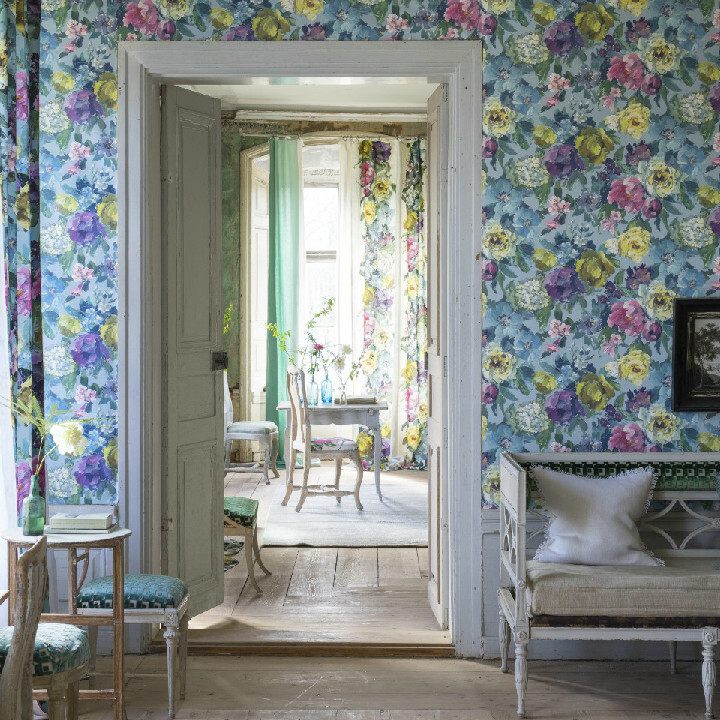 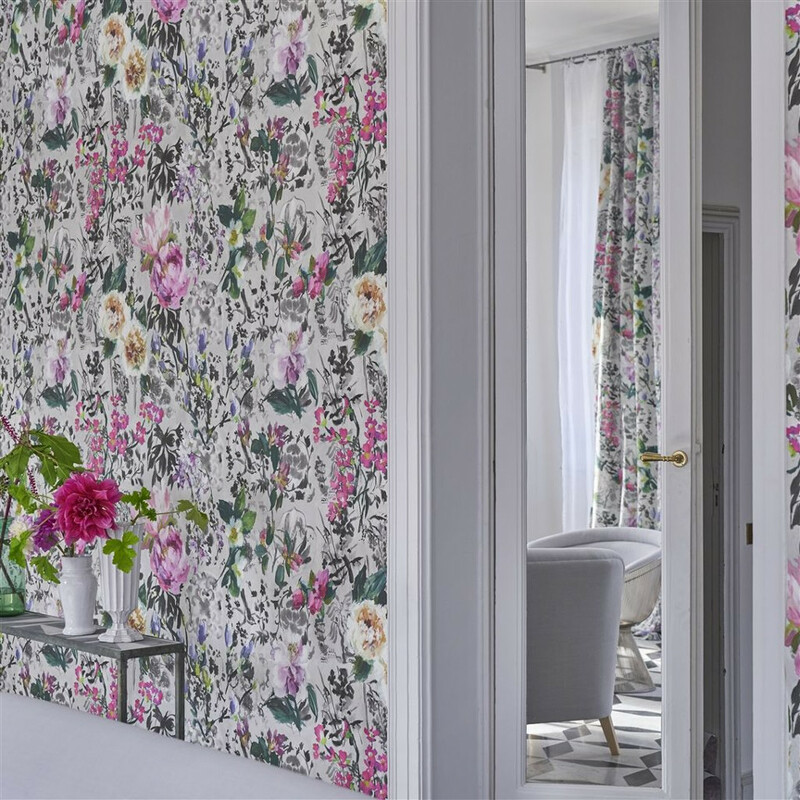 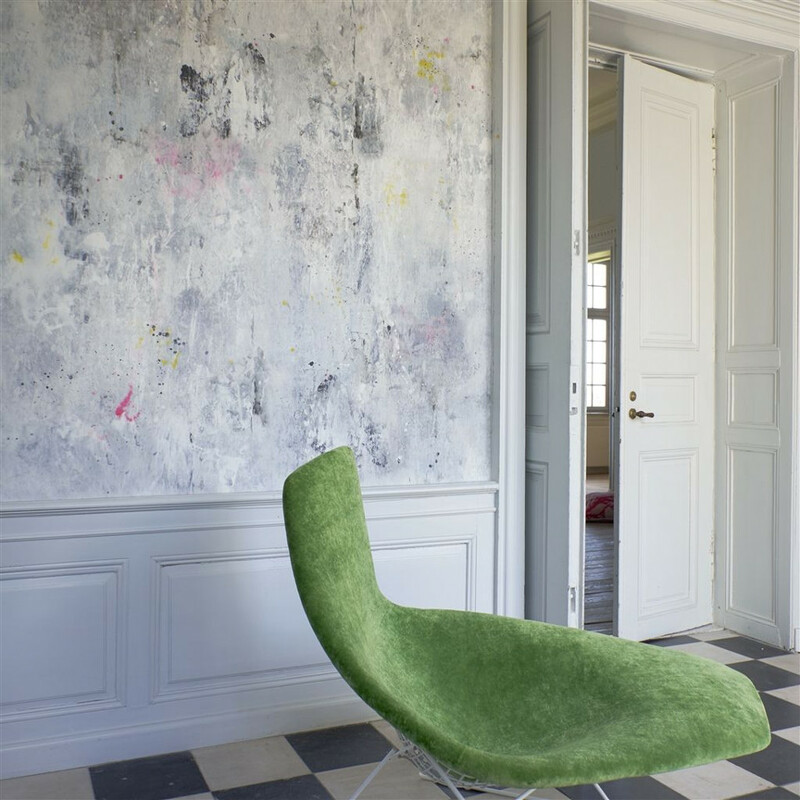 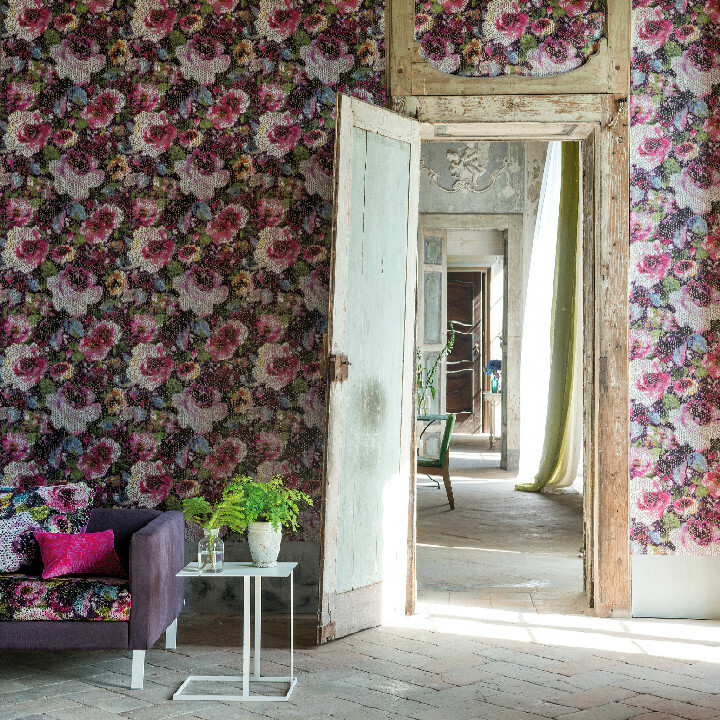 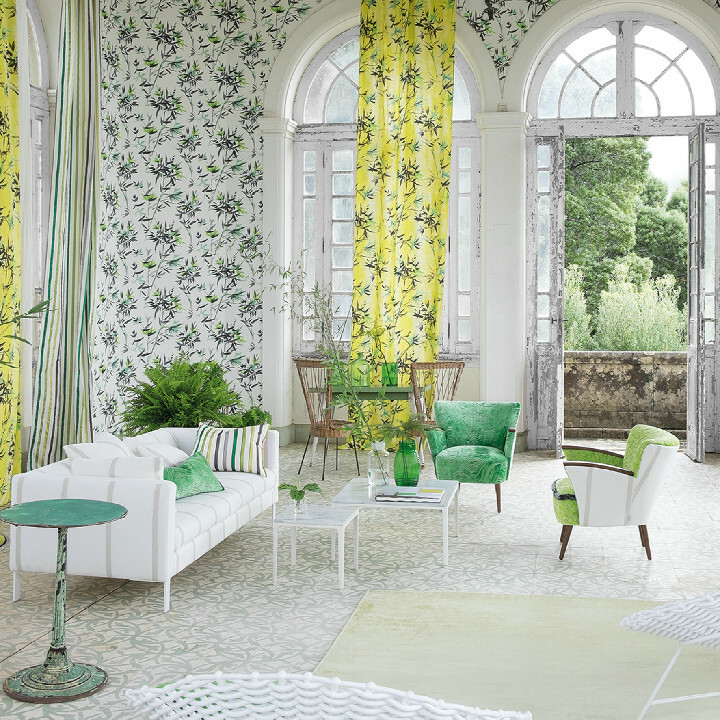 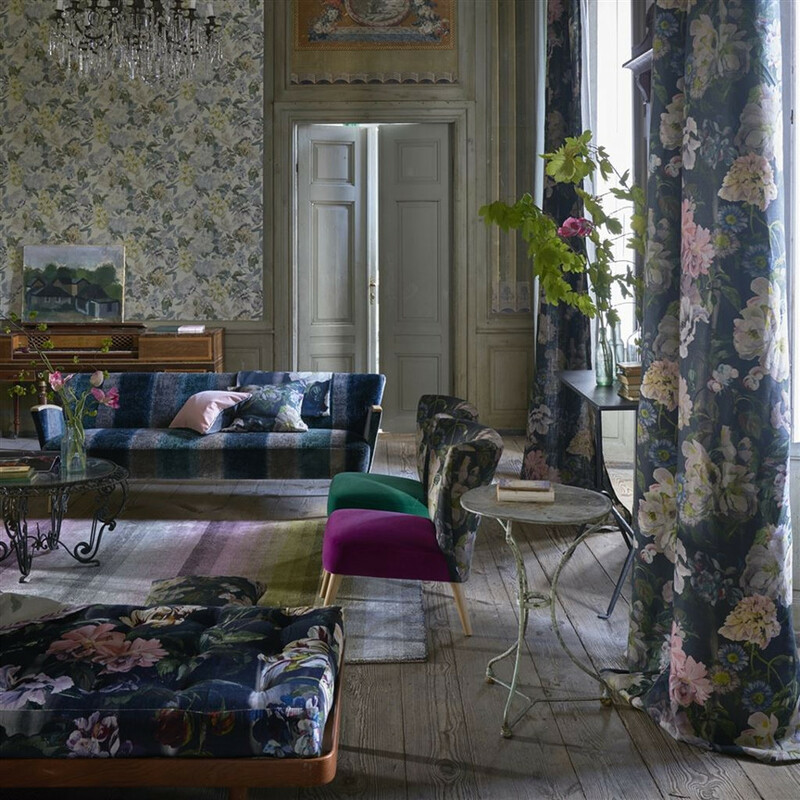 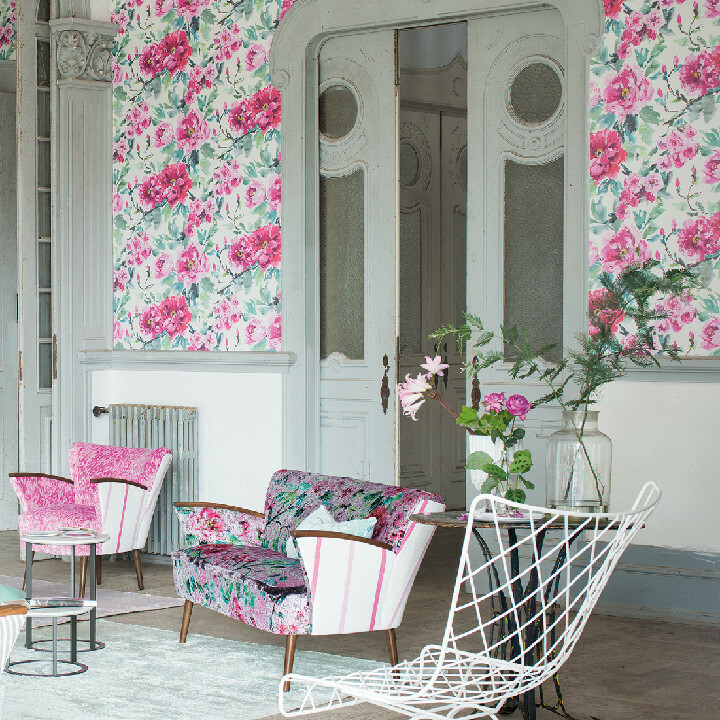 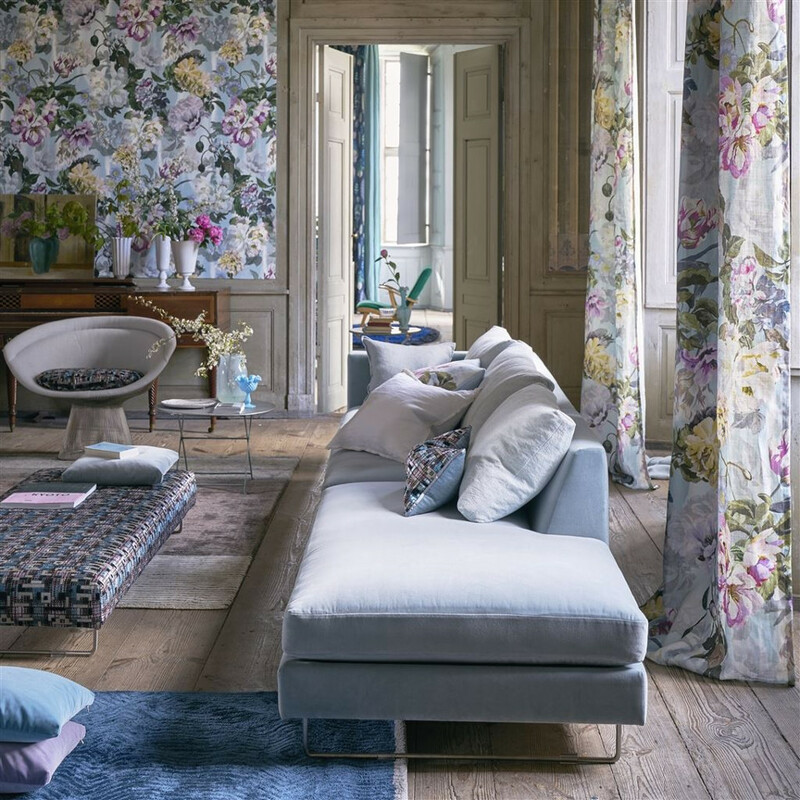 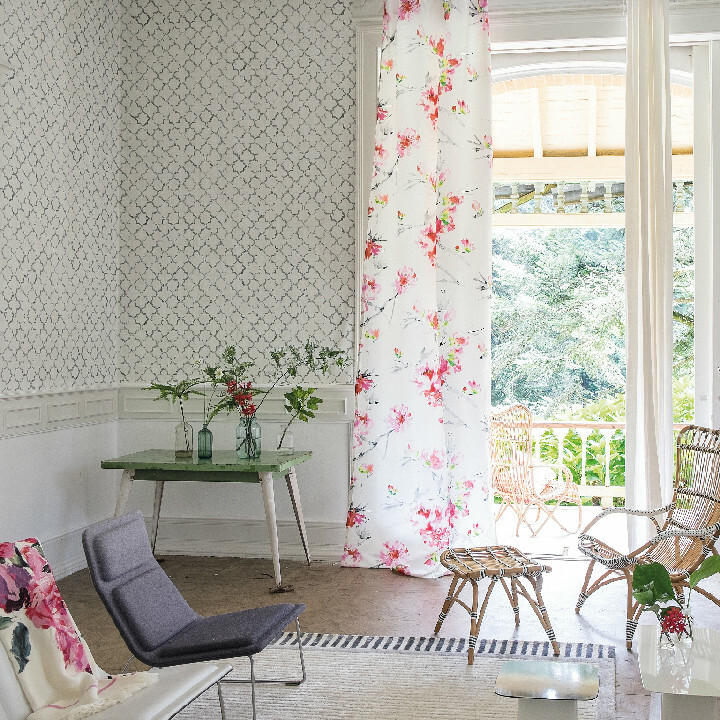 Designers Guild latest collection Caprifoglio is an unsentimental floral collection, graceful and full of discovery. 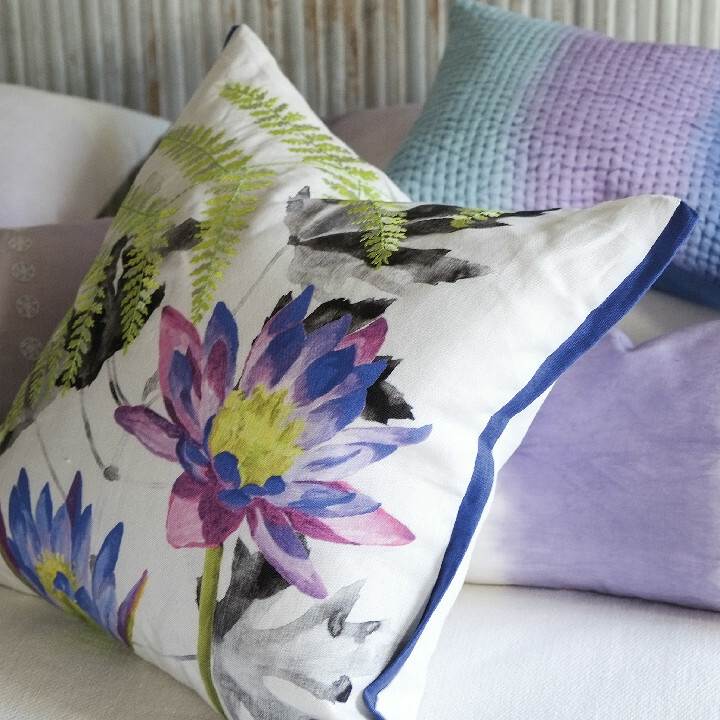 Hand-painted flowers are digitally printed to capture every stroke of the painter’s hand. 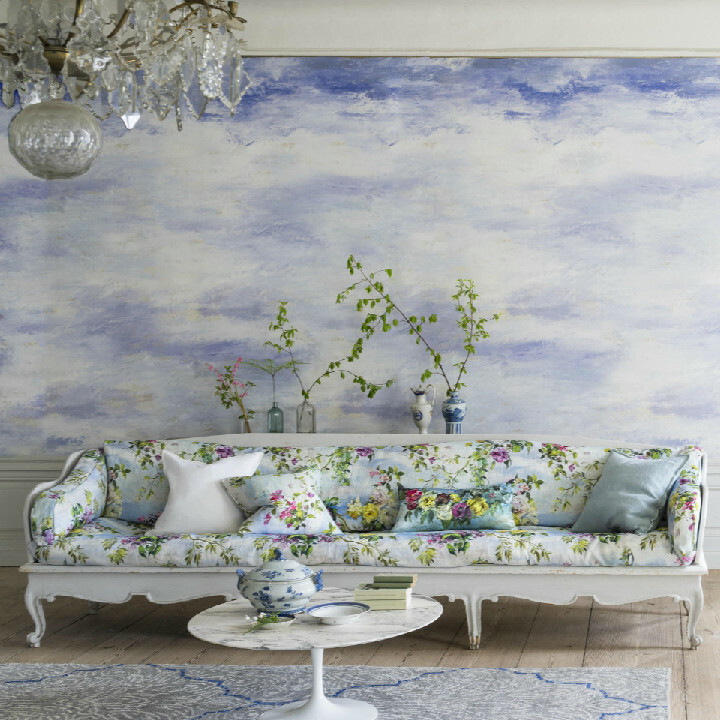 Set against subtle frescos, the distressed plaster of a walled garden, or liberating open skies. 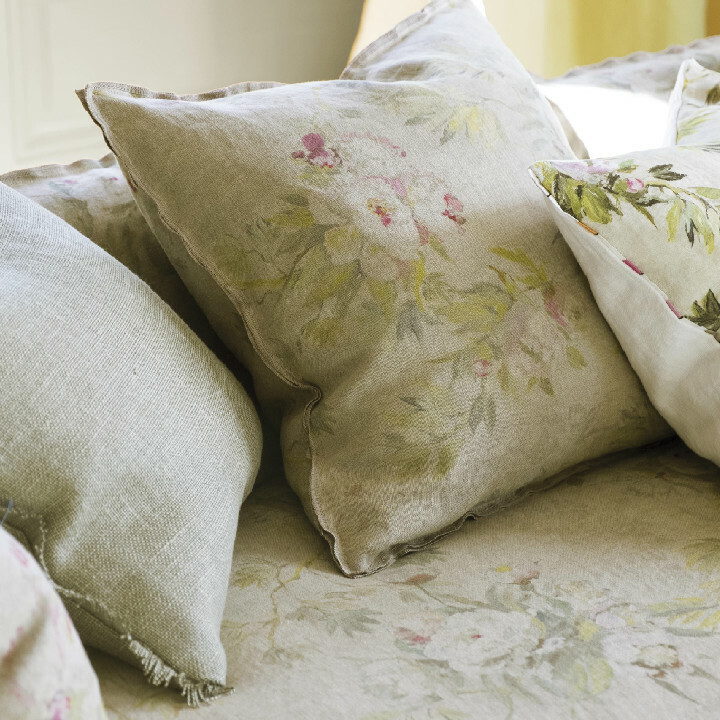 Fabrics are all on voluptuous velvets, crisp cottons and luxurious linens. 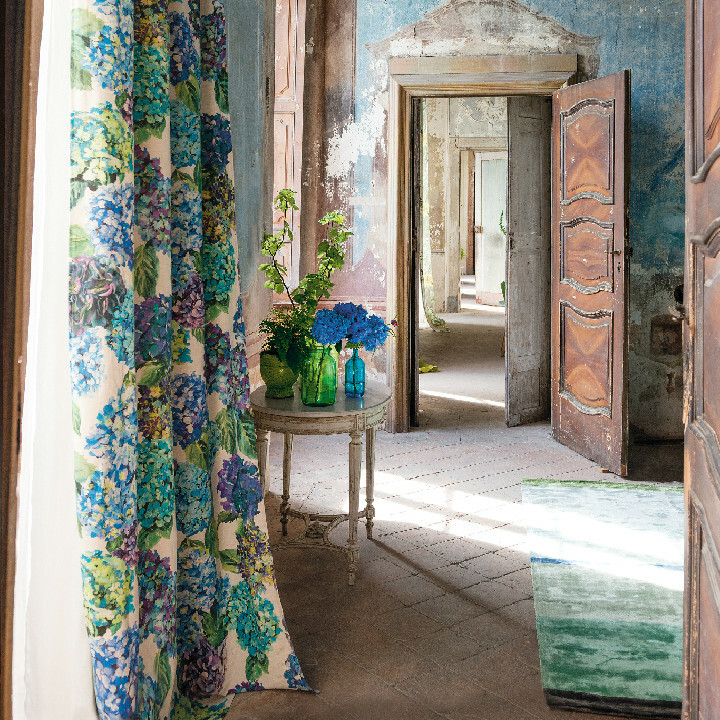 Swirling contemporary silk jacquards, and glittering antique damasks enrich and complete the landscape of the collection. 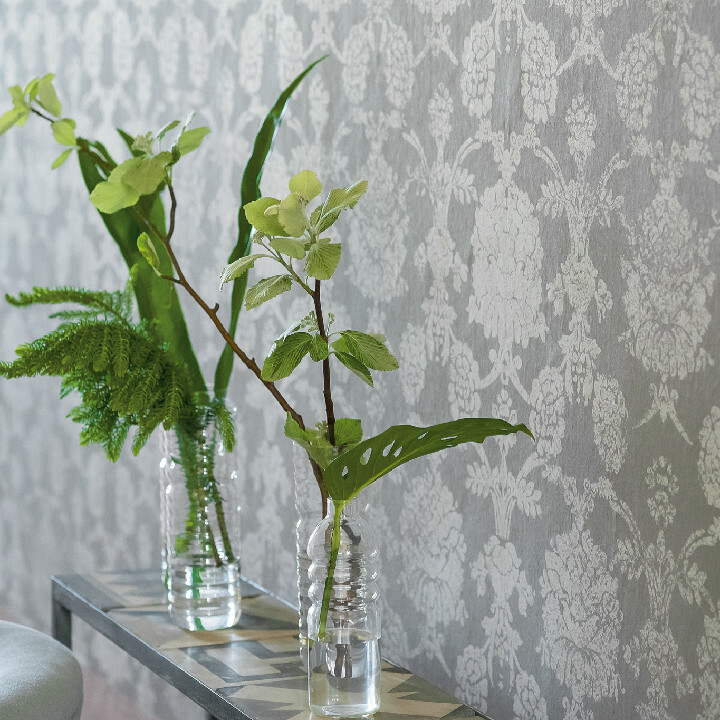 Wallpaper is all on easy-hanging, durable, washable, non-woven grounds. 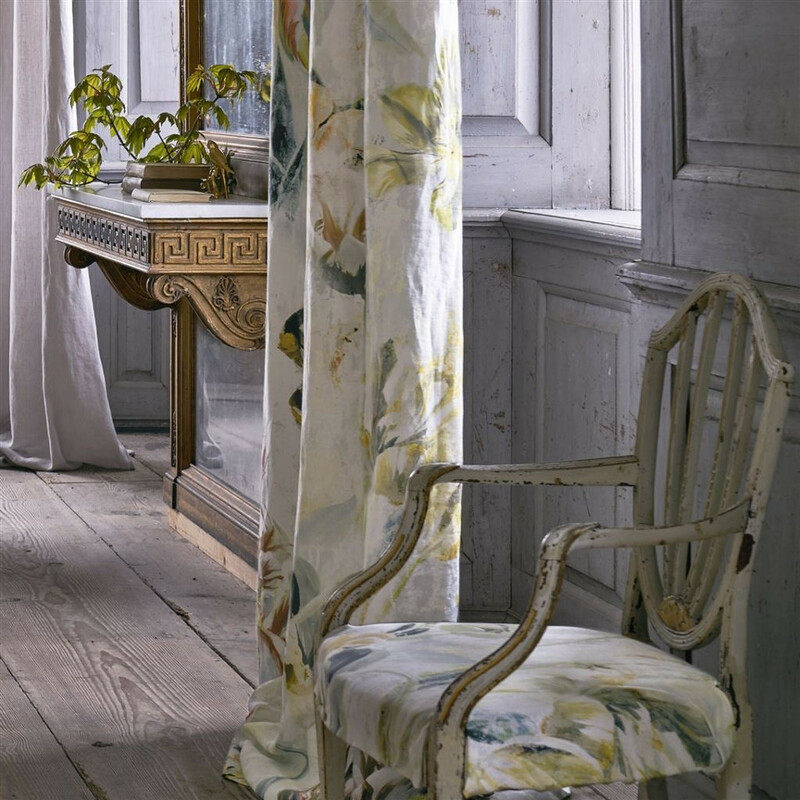 A collection of graceful painterly landscapes and gardens printed on linens, cottons and heavyweight silk. 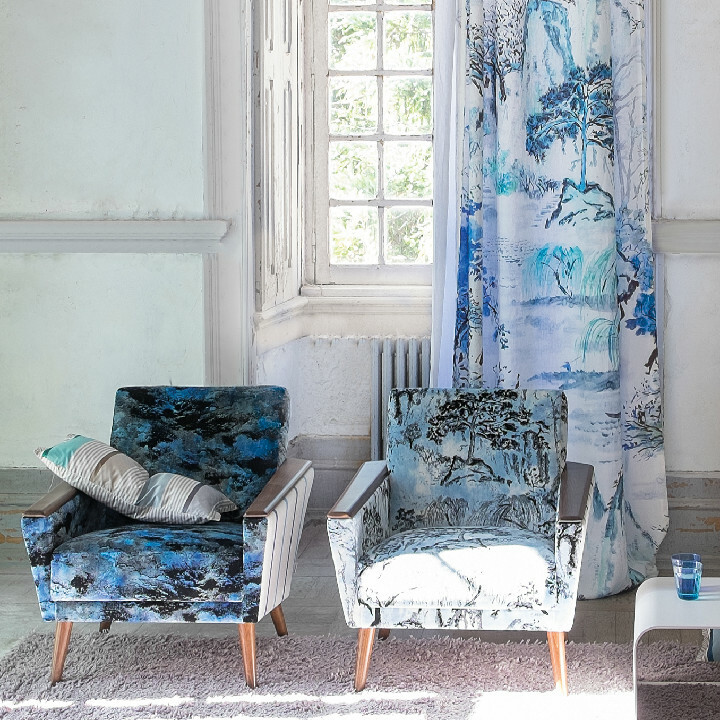 The collection is strongly influenced by classical Chinese landscape painting and calligraphy. 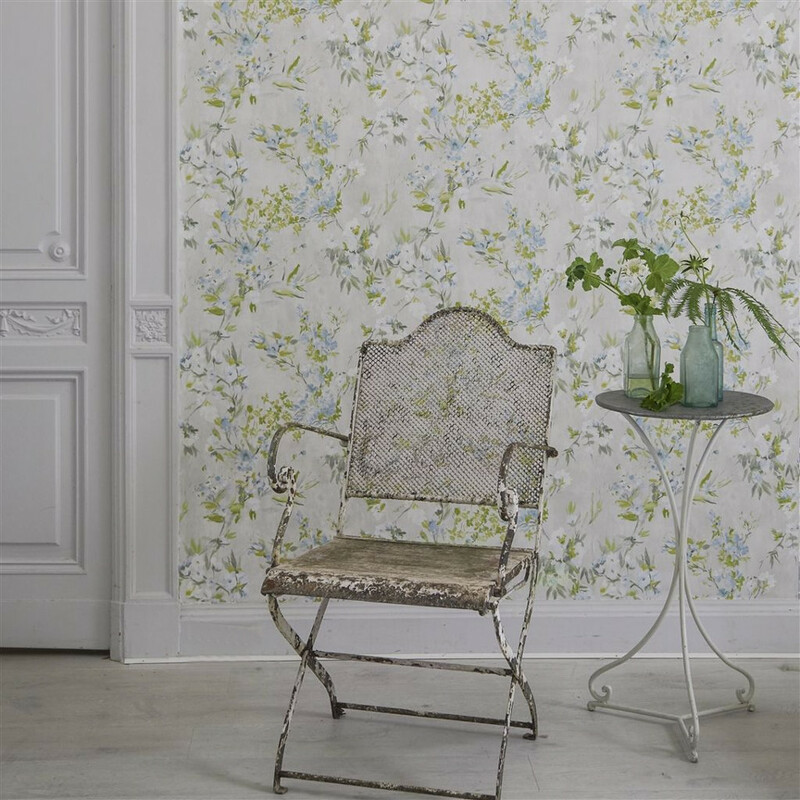 It epitomizes the extraordinary delicate and painterly evocation of mountain, rivers, trees and blossoms. 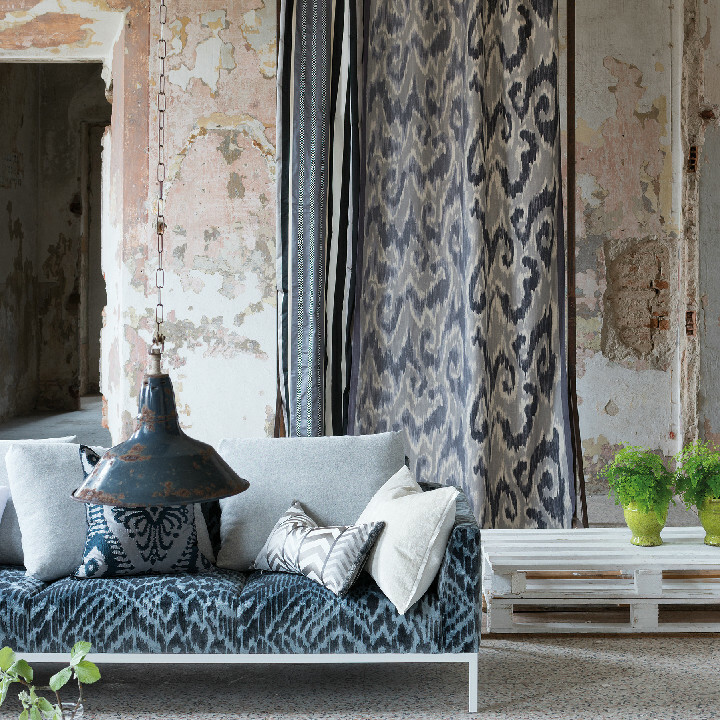 A stunning, modern collection that strives to create atmosphere. 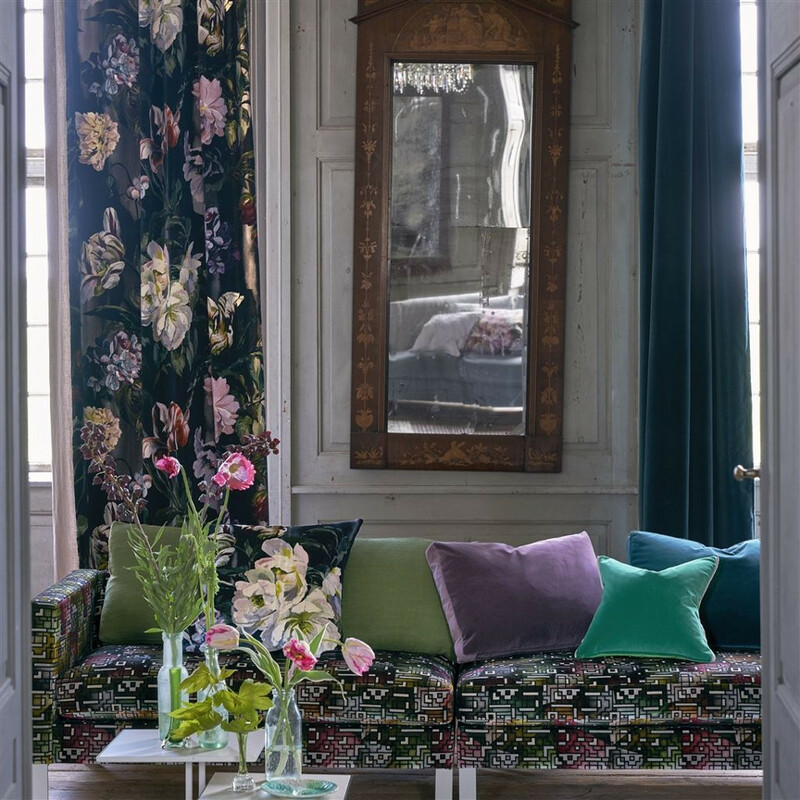 A stunning collection of prints based on Indian and Central Asian ikats and brocade patterns in sublime colour combination. 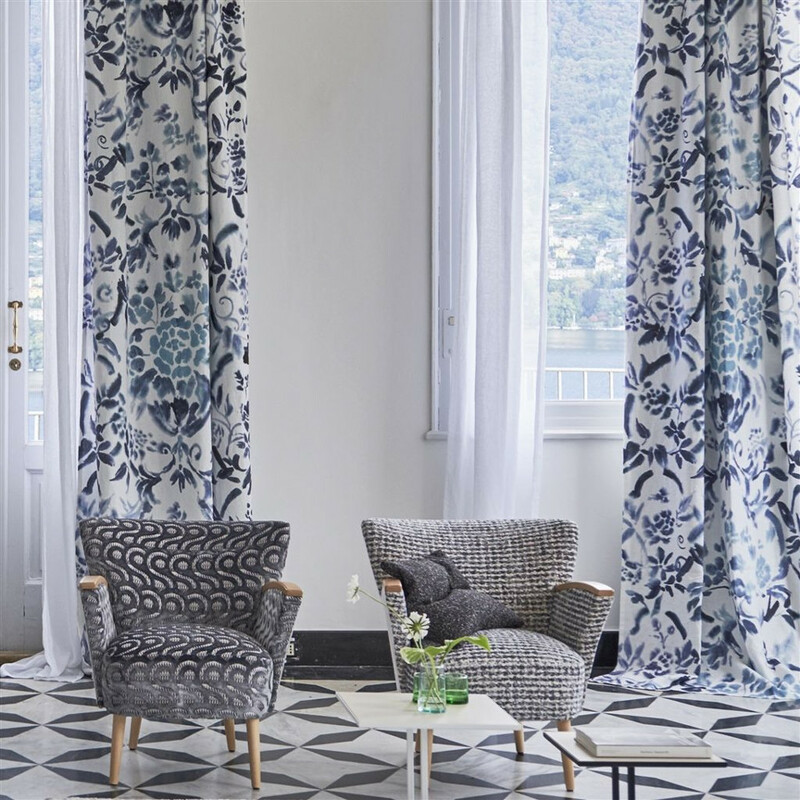 Some of the designs are inspired by the classical geometries of the ikat motif while others offer elegant damask style repeating motifs. 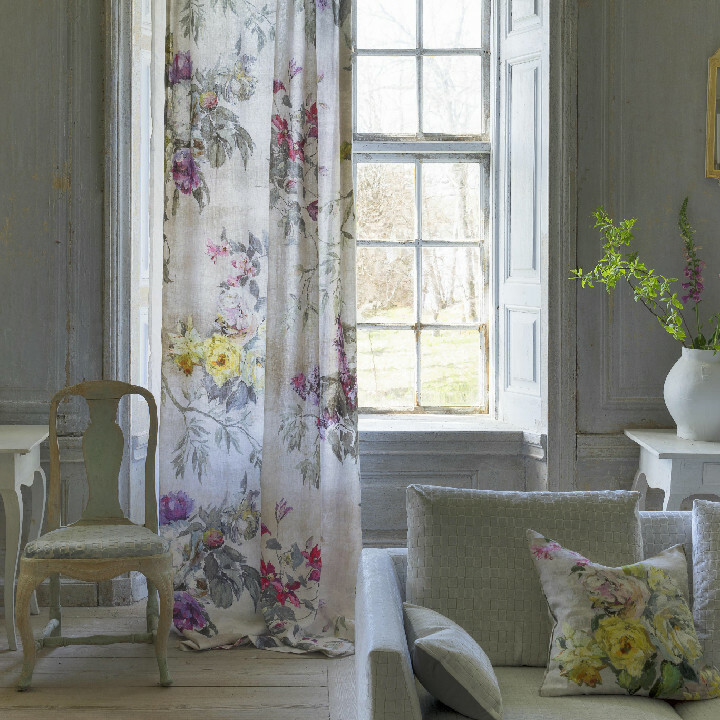 Printed on fabulous fine cotton, linen and linen blends, the cloth is chosen or created to suit the demands of the design. 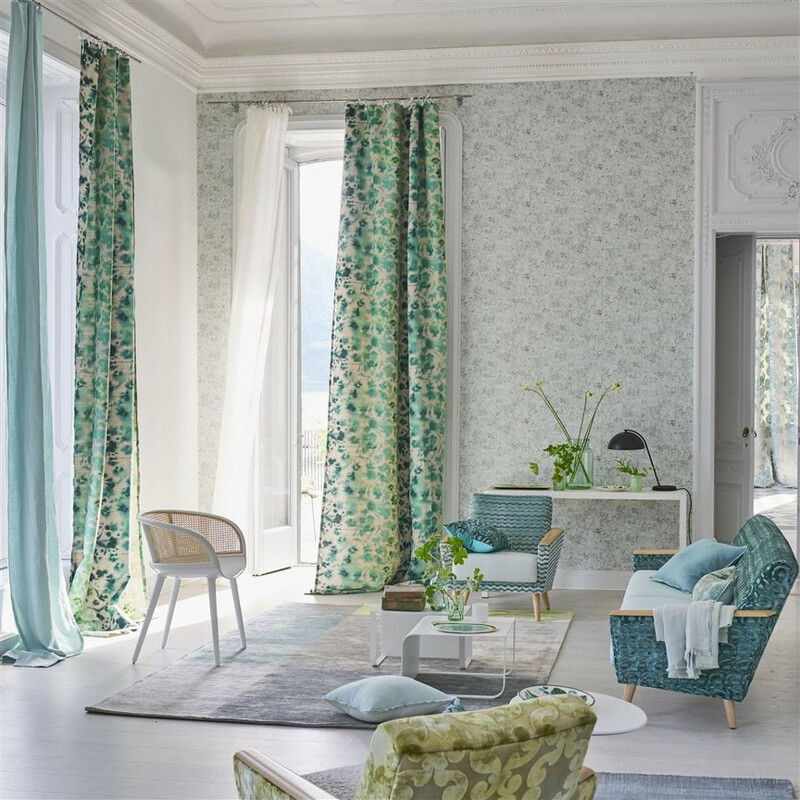 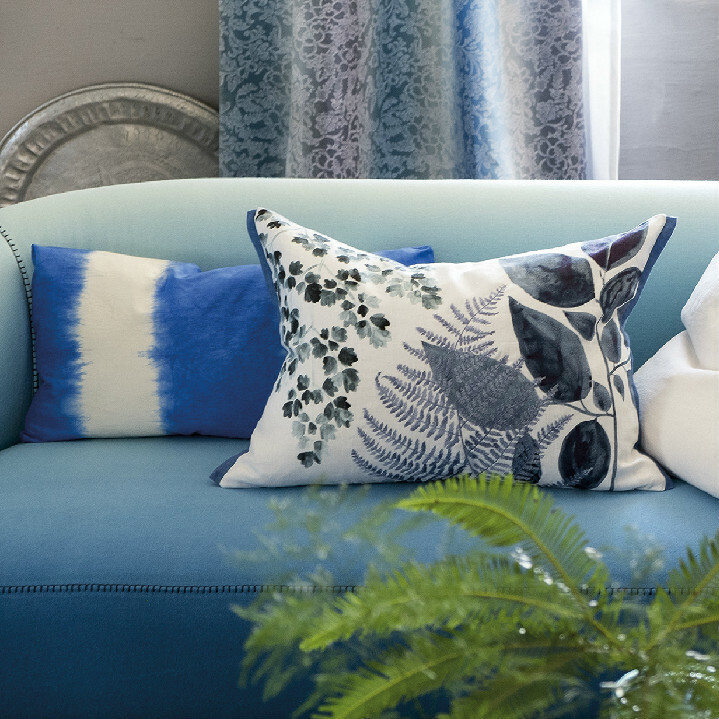 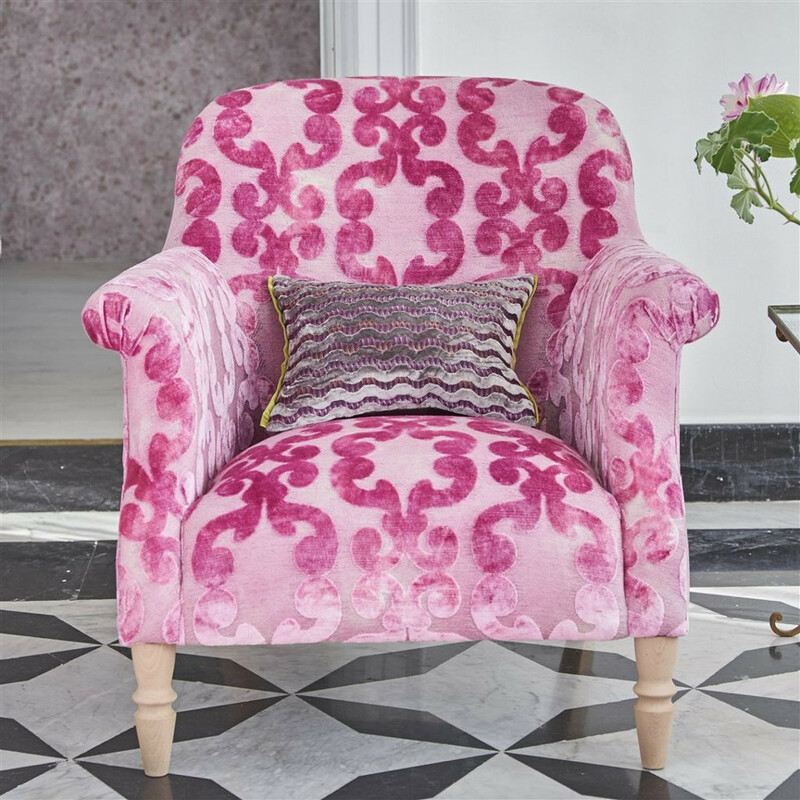 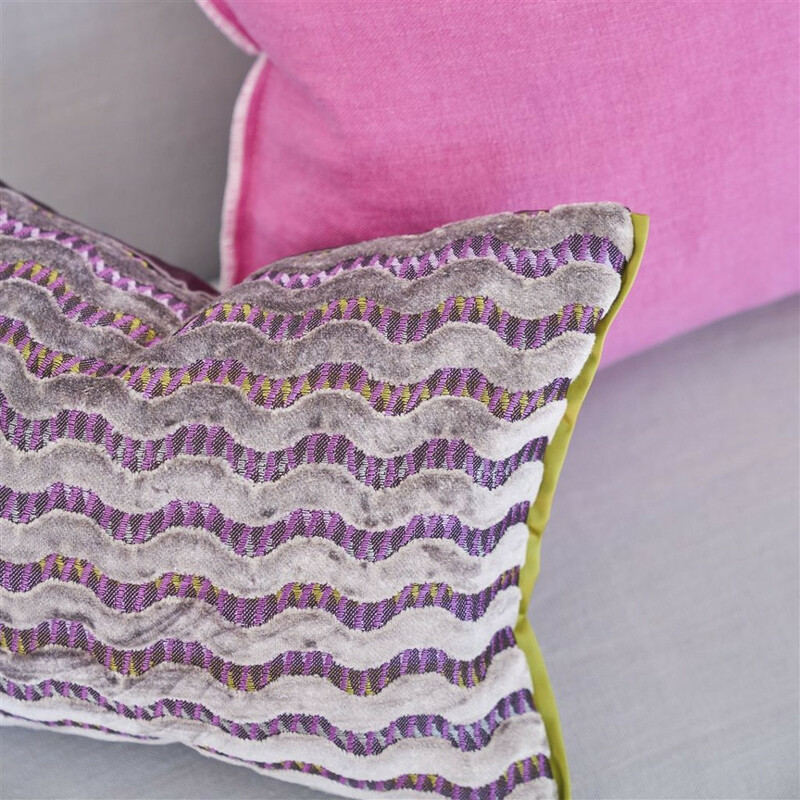 To view the full selection of Designers Guild collections we offer please visit our showroom in Hatfields of Colchester, Essex or call 01206 571000 to speak to one of our experts.